Being popular is cool, but being wanted is better. If you’re ever the practical handy woman (or man) of the house, you know what it’s like for people to ask you for help when they’re stuck in the toilet because of a shoddy door knob or replace a light bulb in case it fizzes out. You also know how it feels like after you helped that person and that feeling of satisfaction of walking away knowing that you’ve made someone feel better. So yeah, learning how to do chores and specialties in the home may be all well and good, but not every specialty is a requirement to learn. Learning how to set tiles on your bathroom floor, for example, may be required in certain occasions but you don’t really need to learn it if you think really hard about its practical application. I’m an interior decorator who deals with matters pertain to beautifying homes on a regular basis, and I don’t know how to set bathroom floor tiles. Seriously. Of everything you might want to consider regarding anything at all, the first should always be about safety and health. If you manage to learn how to tile your bathroom floor, are you sure you can do an upstanding job that would look good and serve your family well? In fact, forget about that for a moment and consider how you’d set the tiles without injuring yourself. Remember, this is your first time setting tiles so don’t expect you’d get everything perfectly. Are you sure you still want to lay the tiles by yourself? Apart from mortal bodily harm, you should also consider the money and time aspect of learning and actually setting tiles for your bathroom floor. If you mess up with your little tile laying experiment, you’d need to hire a professional to fix your mistake and actually finish the job. As such, you’d actually spend more than what you would initially pay if you just hired the professional to begin with. 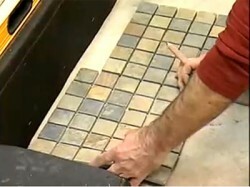 The time required to learn this skill of laying tiles is also something to factor in the equation. In order to achieve perfection in anything, repetition and practice is required. When you learn how tile, you’d take out substantial hours from your life which you could have been using for your work, family, or social life. Attempting how to learn is also not the same as actually mastering the craft, so it’s a risk where you might lose both the time you spent and the attempt of gaining the knowledge. 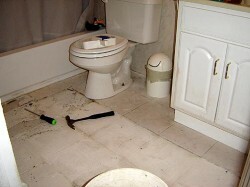 After you do manage to learn how to tile a bathroom, what will you do next? Unlike when you finish law school or med school, you can start a career out if it by being a lawyer or a doctor. With the acquisition of this skill, what would you intend to do? You already have a career so you won’t need this knowledge to start a living. Otherwise, I mean if you need this as a livelihood, you’d probably know about it already and wouldn’t need to learn it after all. It’s not like you’ll be fitting tiles on a regular basis after you finish tiling up your bathroom. Do you see what I mean about how much of a waste it is to learn about setting tiles? Instead of learning this trait, why not hire someone who already has actual knowledge and experience in this field. That way, there is a win-win situation wherein he gets paid to do something he can do well, while you get on with your life and still get a magnificent-looking tiled bathroom floor. Successful people have a lot of secrets, as most of you can tell, but one of them is acknowledging when they need help. Sure, it’s good to be independent sometimes but you have to time it and gauge whether being independent would be beneficial for you and your family in the long run. Paying a professional to tile your bathroom floor I not about being an incompetent handy woman (or man), but it’s about acknowledging what you don’t know/need to know and thinking about your family in the long run.